Carrousels - merry-go-rounds always save the day when visiting a big city with a young family! You'll find about 20 carrousels scattered all over Paris, mostly next to the major tourist sites. The first carrousels appeared in France in the second half of the 19th century and soon became highly popular with the Parisians. The 1900’s are even considered the 'Golden Age of the carrousels' and modern ones look rather similar to the original ones. They are operated by private owners who are granted a license by the City of Paris, and are very much part of the Parisians' everyday life. Paris boasts 20 permanent carrousels! 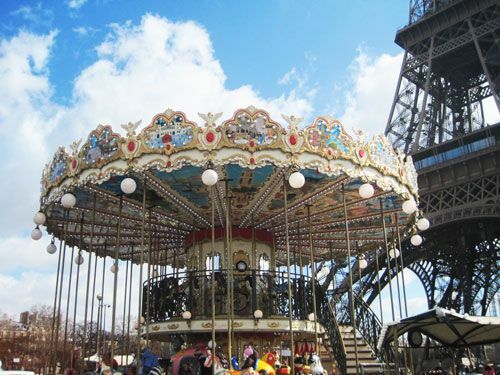 The Carrousel de Paris in the Jardin du Trocadéro is an old fashion dual platforms. Children can ride traditional wooden horses, but also various vehicles and even be lifted in a superb hot-air balloon. The Carrousel de la Tour Eiffel is located at the foot of the tower. It's apparently powered by solar energy and has a large selection of wooden horses and vehicles, including a miniature train. The Tuileries Gardens is a single platform merry-go-round with lovely wooden horses and carriages and a central pillar covered with a mirror. The Carrousel Metro Saint-Paul is the most modern and colorful of them all. It has no animals, but children can ride on various types of cars, planes and ships. 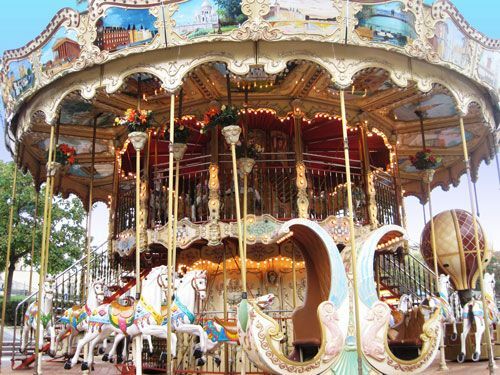 The Manège du Dodo, in the Jardin des Plantes zoo, is one of the most unusual merry-go-rounds! It was indeed built in 1992, but has the retro look of the 1930s and is a true Ark of Noe! It has no vehicle, only animals; children can therefore ride a giraffe, lion, turtle, ostrich, elephant, or some rare or extinct species such a Tasmanian wolf, a dodo, or even a triceratops! The Jardin du Luxembourg carrousel dates from 1879. It is the oldest in Paris and was designed by Charles Garnier, the architect of the Opéra! Its decoration is simpler than that of the other Parisian carrousels, but it has a unique charm. 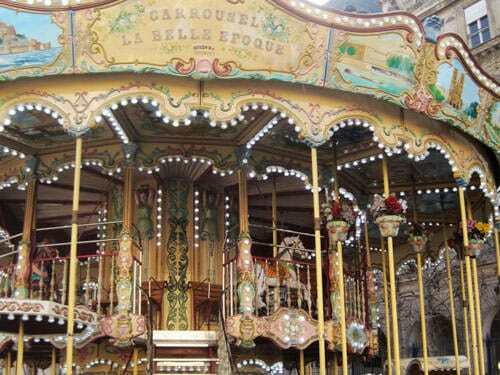 It indeed consists of a revolving wooden platform topped with a green and yellow dome, with few gondolas but many different animals such as wooden horses, deer and giraffes. The Carrousel du Parc de Bercy is another traditional merry-go-round, where children can ride wooden horses and carriages and even a cow that pulling its tongue! The Carrousel des Impressionistes stands on Gare Montparnasse square. Wooden horses and carriages revolve around the central pillar, which is decorated with reproductions of paintings by Monet, Manet and Renoir. The Jardin d'Acclimation is the oldest amusement park in Paris, and is located in the Bois de Boulogne. The small merry-go-round in Parc des Buttes Chaumont is the second most modern of all. The traditional carrousel in Parc de la Villette has two platforms. Wooden horses are on the upper platform; hot air balloon, airplane, Tintin style rocket and tram are on the lower platform. If your children want to ride on a miniature bus, you must take them to the Square des Batignolles. 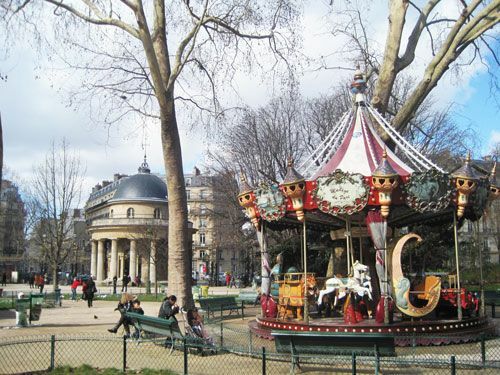 You'll find the Manège du Parc near the splendid rotunda in Parc Monceau. 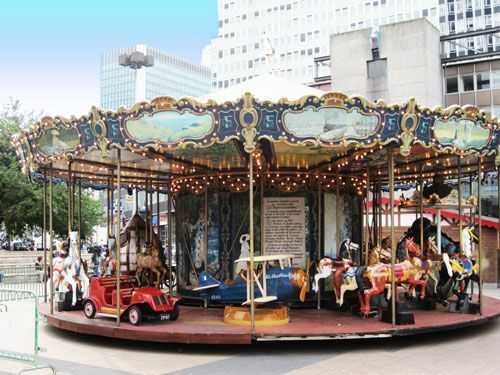 If your children are looking for unusual vehicles such as a miniature Harley, they'll enjoy the merry-go-round located in Saint-Mandé - Bois de Vincennes! 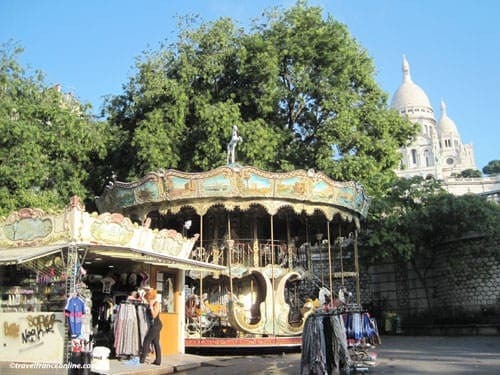 One of the most popular merry-go-round is located on the tiny Place St-Pierre, at the foot of the Sacré-Coeur Basilica in Montmartre. The ceilings of the Italian-built merry-go-round are painted with views of the Canals of Venice. You'll find more carrousels around Paris, temporarily set up for the summer season or the time of a fair. The modern and seasonal merry-go-round on Place Voltaire is known as the Supersonic, as it only has miniature spaceships, a theme obviously very popular with little boys. One of the most popular old-fashion carrousels of Paris is regularly set up on Place de l'Hôtel-de-Ville for special events or celebrations. There are other seasonal carrousels in Paris; keep looking for them!